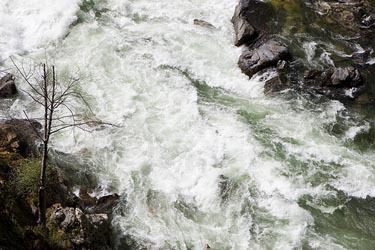 The Cal Salmon is a free-flowing river the depends on rain and snowmelt for good flows. Optimum flows for rafting are 800 – 4000 cfs, kayaking 500 – 5000 cfs, and the inflatable kayak minimum flows are 350-450 cfs. Find realtime flow info on the Dreamflows Cal Salmon Flow Graph. 2000 – 3500 CFS = High flows. Challenging Class V whitewater, fast moving water, with powerful waves and long rapids. Calms between rapids are short and swift. Participants should be athletic individuals with previous experience. 3500 – 5000 CFS = Extreme high flows. Very challenging Class V whitewater. Fast moving water, with powerful waves and rapids with large hydraulics and difficult maneuvers. Participants should be very aggressive and athletic individuals with previous experience, and should not be afraid of falling into the river and swimming through very turbulent water. Because it is a free-flowing river, Cal Salmon water levels can change quickly. In the winter months, rainy weather make the water rise quickly, and in the spring, hotter temperatures melt the snow and the river will peak a couple days later. This is a great river for hardshell kayaks and rafts. Inflatable kayaks can also run this stretch at low flows between 350-450 cfs but should have some big water experience before attempting. Commercial trips are available if you would like to get to know the river before taking a private trip. Memorial Day is a popular time for private boaters to run the Salmon.